Offers a mild level of support that is great at preventing injuries. Very easy to apply. Is the Aircast A60 Brace Right for me? Prevent sprains and rollovers to previously injured, or weak, ankles during sports or other high-impact activities. Try our Brace Advisor for personalized product recommendations to meet your needs! Designed with the athlete in mind, the Aircast A60 ankle brace is ideal for anyone who is looking to prevent an ankle injury. The A60 provides support at the weakest point of the ankle, thus preventing ankle sprain. The A60 design incorporates a stabilizer located on either side of the ankle, which is molded at a 60 degree angle to help guard against ankle sprains and rollovers. Great support for all sports. Can be worn in water. Rinse with cool water and air dry after use. Would this one make me happy and offer the same protection for my very weak ankles that you can compare to those of Peter Forsberg ?? The A60 is going to provide the rigid supports on each side of the ankle to help protect you from rolling, As well it is a pull on style so you don't have to lace it up everytime. It also is cut to a 60 degree angle which provides more stability while on your toes in an athletic position. The Aircast A60 Ankle Support, https://www.betterbraces.com/aircast-a60-ankle-support-2, is a milder support brace, that incorporates a 60 degree, molded stabilizer, to prevent rollover. Im looking for a brace for posterior tibial tendonitis. Preferably, something that is light weight and does not restrict my range of motion as I play soccer. My daughter is a gymnast. Is this brace ok to wear barefoot? Yes, the Aircast A60 can be work while barefoot. My son had a low ankle sprain, and continues to reinjure. Would this ankle brace help? Yes, this would be great for your son. The 60 degree molded uprights will provide the support and stability he needs, it is also low profile which means it will fit into most of his shoes without causing any discomfort or too much added bulk. I am a size 8.5-9....Should I get a small or medium size? I would recommend getting the medium size brace. Is this a good brace for beach volleyball? If not which would you recommend? Depending on what your injury is, yes this brace works well for beach volleyball. It is easy to put on and offers a mild level of support. No, the Aircast A60 is based off shoe size, and will accommodate different ankle widths. I wear an 8 -9 shoe narrow. I'm inclined to ordering a small to support my ankles during return to hiking after an ankle sprain . What do you recommend? Does the aircast A60 ankle support have metal or bone for stabilizers? My daughter is trying to move to the next level with her cheerleading flying skills. The coach says she "rolls" her ankles. What brace withhold be our best option? Aircast A60 or different brace? I'm between an 11.5 and a 12 in sneaker. Should I go Up or Down in size? I and recouping from a broken ankle with ligament damage. my ankle is now unstable and may require surgery in the future. I am wearing the aircast airsport per my doctor. My question is, I am going on a cruise next month can this brace be worn with bare feet or sandals? I'm a competitive bowler. I slide with my left foot, and last year I rolled my left ankle when I stopped suddenly. There was moisture on the lane. I'm slowly trying to get back to bowling again. When I bowl now my left sliding foot turns inward slightly and I think to myself that I might roll my ankle again. Will the air cast brace help keep my foot straight and prevent rollover or can you suggest a different ankle brace that would help. I have this brace and if possible i would like to obtain an additional pump. Do you sell those separately ? 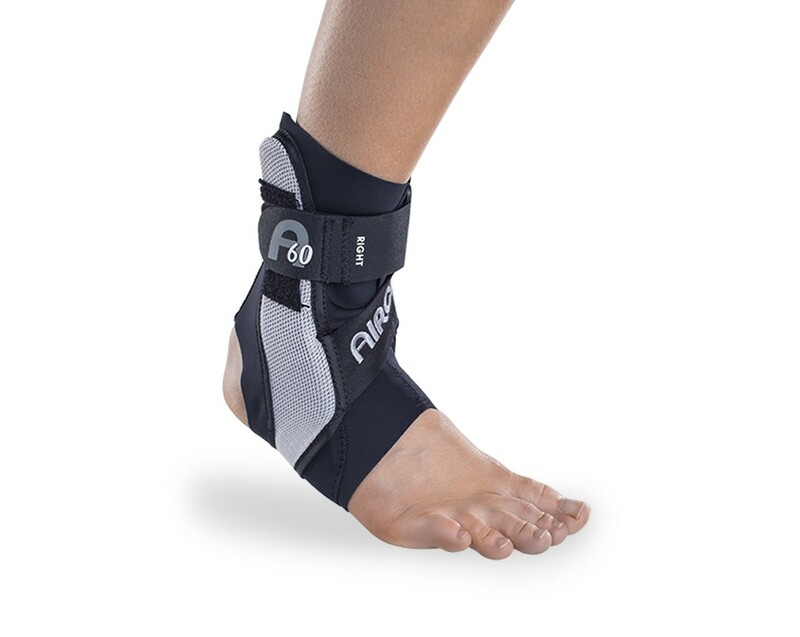 The A60 Ankle brace does not come with a pump and does not need to be pumped in any way. I think you must have a different brace. I am ordering the aircast A60. The size chart for small goes up to 8.5 for women. I wear a size 8. Would you recommend the small or go to a medium? I play rugby and have issues with chronic ankle rolls/sprains. I currently have lace-up type models of ankle braces but they are bulky and uncomfortable. I noticed multiple products now with a neoprene sleeve instead of the laces. Will these types of braces provide the same level of support? Second question are there a slimmer profile making it more comfortable to wear in my rugby boots? I had polio years ago and my left leg was not fully developed. My left ankle is weak and unstable especially when I play golf . What type of brace do you suggest? It depends on how much support you will need. The A60 offers mild support to the ankle, the AirSport ankle brace offers moderate support and the Velocity ankle Brace offers the most support. All of these braces can be worn while you play golf. My shoe size varies between 8.5 and 9. Should I order a small or a medium Airiest A60? My son is a competition cheerleader and had surgery on his foot in sept. Can this brace be used to compete and tumble with? I play ice hockey and recovering from a right ankle sprain. It has taken over 5 weeks to recover so far. Will this brace work with hockey skates? My son has turned his ankle multiple times. He plays soccer at a very high level and is extremely fast. I am looking for comfortable ankle support that will not slow him down. My son wears an 11 1/2 shoe, should I order him a medium or large? Also, he recently sprained his ankle and has a metatarsal fracture, would the A60 be the best brace for him. He will start playing basketball in 2 weeks. Is the A60 good for runners that have had past (but healed) rolling ankle sprains. I need something that prevents rolling to the outside but isn't bulky in my shoe. My current aircast has rubbed away the inside of my running shoe. Thanks. The A60 will provide mild ankle support and is low profile enough to fit in your shoe. I have a size 12 foot and I was wondering if the large would be to big or do I want it to be snug and get the medium? What is the difference between this and the Bionic Ankle Brace? they are the same brace except the bionic has the reflective surface and different colors. I have a fused ankle and I am looking for a brace to help support my ankle when I am just walking around the house. I would be wearing my sneaker or slipper but maybe just socks occassionally. The A60 offers mild support that can be worn with or without a shoe. This should be sufficient for just walking around the house. I have thick ankles and calves. Does this item have circumference dimensions? I don't want it to be too tight on my ankle. Hi, I'm a hunter/jumper rider and recently broke my right ankle in a riding accident. My job is very active and sometimes requires that I walk over rough terrain, and I also want to return to riding and competing as soon as possible. I'm not weight bearing yet, but I'm looking for something I can use for maximum support when I become weight bearing, and also when doing athletic activities. It would be nice if I could find something that would do this and also fit nicely inside my tall boots for riding, although that might be asking a bit much. What are your recommendations? The most supportive ankle brace we sell is the Velocity Ankle Brace. It comes with three different support levels and would fit into tennis shoes but might be a fit tough with boots. another option is the Don Joy Stabilizing Pro ankle brace. This brace is for moderate support and would fit into both tennis shoe and boots. I sometimes takes a size women's 8.5 and sometimes a 9. Which size would work better for me? Thank you for contacting Donjoy. This particular brace is made of Spandex material, and it slides on like a sock. A size Small is recommended from a womens shoe size up to an 8 1/2. If you have a wider foot I would recommend going up in size. The Aircast A60 side support is a bit to long on the outside of my calf. How can I reduce the one side of the splint since it's cuts into my calf and is more painful than the injury itself. Will removing the small amount of the plastic splint material cause the ankle support not to work correctly? We do not recommend altering the brace in any way, you may need to go with a different ankle support if the A60 is causing pain in other areas. The Don Joy Stabilizing Pro is a great ankle support, fits into a shoe and should not cause any extra pain in the leg. I have had past injury in which I had ligament reconstructive surgery many years ago that has done well, but I still have some instability and prone to twisting my ankle. I am very active and looking for something I can wear in athletic/cycling shoes for biking, elliptical, hiking, light crossfit/weights, yoga, and occasional walking/jogging but without added bulk, discomfort, or limited mobility. I was looking at the Aircast A60 or Donjoy Bionic Ankle. Would these be appropriate for my activity level or should I look into something else? Yes, both these braces provide ligament sport to the ankle. The 2 rigid supports on the inside and outside of the ankle will prevent you from rolling the ankle. Both are appropriate to wear during athletic activity. Please contact us with any additional questions at 1-800-553-6019. I run ultra and need support when running, my ankle rolls and after a long run I get pain on my ankles and Achilles. These two braces offer the same support but the A60 is a little lighter wieght than the bionic. The bionic is neoprne material which can be hotter and more bulky. I have mild cp. Its my heel and my ankle that need support. The only braces I see here help one or the other, not both. I also need a brace that I can wear for 10 hours a day with my work boots. Any advise would be greatly appreciated. Any likelihood the manufacture would be willing to improve the quality of their product? The repetitive complaint of fabric breakthrough is a reoccurring issue. The main area of breakthrough is at the top area where the plastic/fabric meet. I have the same issue and had to resort to sewing a reinforcement piece of fabric to fix the problem. There is no reason why the manufacture could not address this problem and reinforce the breakthrough points so the customers can have a more durable product. The product works for sure but the length of service is marginal at best. Buying a product over an over is not good business in the long run. I can't find any contact info on who actually makes the brace. I have a mild sprain to the inferior extensor retinaculum and need a brace to support my ankle while walking. Which brace do you recommend? Also, my goal is to return to snow skiing next winter. Is there a brace that can be worn in a ski boot? Is this brace good for everyday use(i.e.walking/standing for work, and using treadmill & bike at the gym)? How long does this brace tend to last if worn everyday? Previous braces that I have used, off the shelf from pharmacy's, don't seem to last as long as I would like before they start to stretch out and not seem as effective. I sprain my ankle a lot due to instability. It is always the anterior talofibular ligament that is sprained. It also usually stops hurting in a day or two. I usually exercise by running and would like a brace that does not have as much bulk. What brace would you recommend? I dislocated my ankle about 50 years ago and when they reset it they did not reset it correctly and my right foot is not parrelel to my leg bone. All my foot bones have fused together and when I walk my right ankle tools out to the right. Will this brace help me to stabilize my ankle from rolling out ? Since the smaller size is too tight then you will need to go with the bigger size. My daughter is a competitive gymnast and has had multiple ankle and foot sprains. Her ankle is healed now, but is generally weak and prone to injury. She hates wearing tape and wants a brace. Is the Aircast A60 a good brace for her? I did not see any other questions related to gymnastics, specifically. How much will I get if I order them? Does it come in a pack of 2 or just one? Because I am a high school football player and my position is Full back and my ankle's roles way to much and its stopping me from being the best I can be. I really need 2 for both my ankles and if I want 2 will it sat around 50 dollars or around 100? Janet, thank you for taking the time to email us here at www.betterbraces.com regarding your Ankle Injury and getting the best Ankle Brace for your condition. Our Donjoy Velocity Ankle Brace is the best on the market for joint stability and will assist you in keeping your ankle from rolling in and out while walking. Are the side supports for the A60 brace as rigid as for the Airsport brace? The A60 stays are more flexible than the airsport, as the A60 is designed to be used without a preexisting injury. Visually this item looks significantly lees bulky than the Airsport Ankle Brace. Is that the case? Yes, the A60 is made up of a thin breathable material and has a 60deg molded plate that contours to the leg for less bulk and protects the ankle from rolling, and preventing injury. What are the side stabilizers made of on the Aircast A60 Ankle Brace? I'm recovering from a serious sprain and (optimistically) hoping to go hiking in three weeks. I have excellent boots but obviously need something to support and protect the ankle on the trail. The supports on the Aircast A60 are made up of a rigid yet flexible plastic material that is molded to a 60 degree angle. This ankle brace is ideal for wearing with your hiking boots. It will give you the support and stability while walking on the uneven terrain. I recently broke my right ankle and my orthopedic gave me this after my foot was healed and when I was cleared to go back to gymnastics I was tumbling and my LEFT ankle snapped in half, so after that being broke I got another from my orthopedic for my left ankle. I now wear one on both ankles and just went back to my first practice scared to tumble because snapping your ankle in half isn't fun, but these didn't let me down. I trust these a lot even after breaking both of my ankles and not tumbling for 6 months. Due to a gunshot wound, I eventually lost my ankle. Years of crutches and fixators regrew the bones, but the ankle wore off. It is amputation or wear an Aircast A60 and MBT shoes. The sole rolls leaving the ankle fixed under the brace. My orthopedists all concur. Six years and counting and I still have the leg. They wear well, can be washed, and are relatively inexpensive. I'm an avid tennis player and was nervous about getting back onto the tennis court after fracturing my ankle. The Aircast A60 fits comfortably in my sneaker and gives me the support I need. At first I was fearful about turning my ankle, and was holding back to go full out for the ball...but in this brace I couldn't turn my ankle if I tried. I'm so happy I purchased this ankle support, and am back to moving around the court the way I did before my injury. My son plays offense and defensive lineman for High School Football. He has rolled his ankle multiple times. His doctor advised him that he needed to wear a brace whenever he plays. We tried several other brands of ankle braces with no luck. The main problem was that they were too bulky and he would still roll his ankle. We finally ordered an Aircast Airsport Ankle Brace and an Aircast A60 Ankle Support Brace. He liked the Aircast Airsport Ankle Brace but the Aircast A60 Ankle Support Brace fit better in his cleats. He now uses this brace all the time and has had no more ankle injuries. This brace does not interfere with his footwork. It is lightweight and easy to put on. I am ordering a second one because he has worn the first out with hard intense use. I highly recommend this brace for Football players. I'm paralyzed in my ankle, so I have no ability to prevent ankle rolling. This brace provides enough support that I can even go hiking. It is easy to use, gives good support and is durable. It is the easiest to fit into a normal shoe. I would like to see a version with greater stiffness as an option, and a little more durability in the mesh, but this is my go-to brace to wear every day. This is the only ankle brace my high school daughter will wear. She has worn the A60 for 6 months through club, indoor and now high school soccer. We are on our second A60 due to the the mesh fabric tearing near the top of the brace. No other brace met the criteria for providing protection to the ankle while being easy to put on and fitting nicely in her soccer cleat. We have tried the DONJOY Sports Ankle, AIRCAST Air sport, PROCARE Kallassy, McDavid ultralight ankle brace with straps, McDavid Lightweight brace and the Mueller Soccer Ankle brace. The A60 is not uncomfortable and allows her enough flexibility to play with confidence. This ankle brace is one of a kind I bought it for both my left and right foot. I'm a 36 years old man that plays basketball a few times a week, for years I was looking for a ankle brace that would hold my ankle in place and would completely support my ankle and help prevent ankle sprain. This ankle brace is one of a kind I bought it for both my left and right foot. After years of abuse on my ankles from being in the military, I needed ankle surgery to repair a few ligaments. During my waiting time, and after I wore this brace and it very much did what it says it does. My only complaint is after almost a year of daily use it stretched a bit and the mesh began to rip. I will continue to use this brace while running and daily use for as long as they keep making it. I use this brace every day. I got fitted for a custom and this one is more comfortable. Love this brace. I broke my ankle a couple of years ago and it gives great support. I use this brace more then my custom fitted one. The only con I have is the the strap is a bit to short and so I can't get it as tight as I would like.